I truly, swear to God, hope Sookie will be able to open her eyes soon and figure this out herself. I will I could write her a secret letter (complete with expensive stationery ensemble!! LOL!) with our theories on Bill. 😉 WAKE UP, WOMAN!! LOL!!! Gigi – I love your dream analysis. 🙂 I never thought of it that way, just felt that this dream seems odd and out of the ordinary. 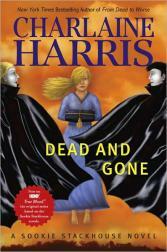 I know there are many people who didn’t like Sookie in DAG or didn’t like the book period but I liked it alot. I liked that it was darker, and I understand Sookie seemed a bit different but then again people do change, she was in her mid 20’s now shes getting a little older so it’s only normal we’ll see changes in her. Plus she has been through a lot and how long can someone keep going through all these things and not be so effected and go through darker times. Thanks Dee 🙂 I’ve recently discovered this blog and there is so much to catch up on but it’s a nice distraction to waiting for my book lol.